Burqas are made by the Andi people, an indigenous West Dagestanian group that lives near the Andi Koysu River. A burqa is not just a warm piece of outerwear, but can also be used as a cloak, a blanket and a tent. Yet, there is just one manufacturer in Russia that makes this unique piece of clothing. Not long ago Elizabeth Hurley posted a photo on Instagram ostensibly in a Queen Catherine of Aragon costume. When inhabitants of the North Caucasus in Russia saw it, they laughed. Under the guise of the queen’s dress, the British actress had slipped into something resembling a Circassian national costume. Anyway, for Circassians (a North Caucasian ethnic group) it’s all in a day’s work. Very different peoples throughout the Caucasus as well as outside its borders have adopted their weapons and clothing. Tsar Nicholas II posed in a special “kaftan-cherkeska” (a Circassian coat) and the “shashka” (a Caucasian saber) became the main cold weapon of the Russian Army. The Caucasian burqa has also been worn by Georgian chaban (mountain) shepherds and Russian Civil War generals. Vladimir SevrinovskyThis long felt cloak has served as clothing and a tent for mountain dwellers for centuries. Strong and firm, it could stand without a person inside it. The burqa could replace a blanket and a bed at the same time. It did not matter what distance a mountain dweller had to go because all he had to do was lay down his burqa to feel at home. Still today shepherds prefer burqas while herding cattle in distant areas to brand new sleeping bags. They say that Cossacks that had caught a cold would cover themselves up with a felt cloak similar to a burqa. They would permit their horse to gallop nearby which would create steam just like in a sauna, which would lead to a fast recovery, thus giving the garment something of a medicinal purpose. Once upon a time a warrior would hide his weapon under the burqa. The enemy would not notice their hand’s movement towards their shashka and would be surprised by the lethal jab of the blade from under the felt garment. This is why the burqa was never given buttons. Fidel Castro, upon receiving one as a gift from a Soviet delegation in the 1970s tried in vain to find the buttons. A firm coat would occasionally save a warrior from a bullet or a saber stab. If the enemy prevailed, the wounded were often carried away from the battlefield on their own burqa. Vladimir SevrinovskySuch an important object was considered magical. In the perception of a mountaineer, a burqa connected the real world with the hereafter. The deceased was wrapped into a burqa, a woman in delivery was covered with it to alleviate pain and a newborn was laid on it. Duels using burqas usually ended with the death of both participants as according to the rules of combat rivals couldn’t step out of the way to avoid a dagger’s stab. It is possible that he mistook woolen braids of a certain sheep breed for a bird’s feathers, which are often used to decorate the best burqas. There were also “rough” burqas made from the braids of wolves’ and bears’ fur. Only well-known hunters wore them – it was considered that this type of burqa was dangerous as it attracted animals and enemies. On the inside the owner would attach trophies – tusks, claws and birds’ beaks. Vladimir SevrinovskyThe highest quality and most beautiful felt cloaks were made by the Andi people, an indigenous West Dagestanian group that lives near the Andi Koysu River. This is the site of the only burqa factory in Russia. It opened in 1925 in the hamlet of Rakhata in the middle of a mountain valley at the border with Chechnya. During the Second Chechen War (1999-2000) the factory was bombed out. It was reconstructed with the help of other Russian regions, although it is largely operating in a self-sufficient manner. Fleece is combed on stands with nails. The fluff is picked with wooden bows indistinct from old-fashioned weapons. Experienced masters would then lay the material on the floor in the future burqa’s shape, but in a larger size – in the process of milling the cloth is constricted. Wool is layered three or four times. The best and the longest are placed on the outside for protection from the elements, while the lowest quality ones are fitted on the inside, with the shortest one in between. The future burqa is sprayed with boiling water using an ordinary whisk. Three or four women in black elbow pads wrap it in a fabric, put it on the table and mangle it, press with their forearms while simultaneously patting it for one hour while the wool is still matted. Then they comb it one more time using wooden brushes with iron teeth. The unfinished burqa is then boiled with a dye. Black burqas are for chabans, while white ones are ceremonial or for presents. Vladimir SevrinovskyDyed pieces of felt are carried out of the factory. Workers take them by the edges, dump them into water to lift the wool up on the outside, and then turn it over and spread it out over gravel. There are so many pieces of wool that the whole courtyard is covered with them. A worker in a kerchief sprays boiling water mixed with bone glue over the protruding strands. In this way a long brush is formed to protect it from the rain. The “pelican’s feathers,” another name for the woolen braids, don’t need to be glued, but the process of making them is much harder. Not many masters take special orders to make them. Dry pieces are brought to a cutter who sew together the upper edges and add a short lining and then the felt “house for a highlander” is ready. 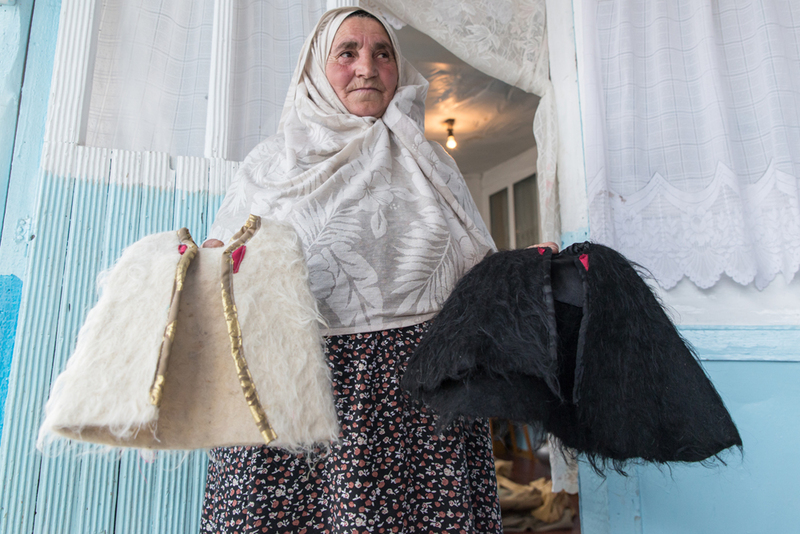 The price for a burqa produced in Rakhata is 2,500 rubles (approximately $40). Masters earn around 500 rubles ($8) a day, which in this hamlet is considered good money. Additionally, production starts early in the morning and is over by noon, so that leaves workers enough time to do some gardening. There were once more than 200 workers at the factory, but nowadays there are only 17 registered employees. In fact, just 10 of them are actually working. The purchasing price of wool ranges from 5-15 rubles ($0.08-$0.22) per kilogram, therefore the local Andi sheep are mostly raised for meat. Fortunately they are exceptionally delicious.